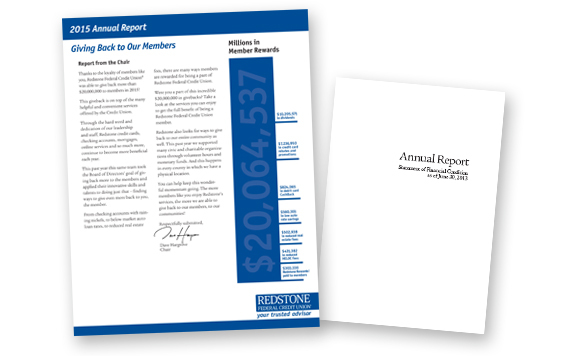 Redstone Federal Credit Union had been printing their entire financial statement as part of their annual report for years and years. It was a very time-consuming process which included typesetting detailed charts and figures, as well as many rounds of proofreading. This piece also had a larger printing expense due to the number of pages (often 60+). Once RFCU leadership embraced the summary financial statement model, JB Communications Group was tasked with creating a drastically reduced annual report which still gave ample space to the Executive Staff and Board of Directors, called out key figures and data, as well as be easier to print and handle. JB Communications Group created a design which included plenty of space for the necessary information while being easy to understand. The illustrations and graphs were designed so they could be quickly used in other marketing formats such as social media. In addition to the design aspect, we also assisted with the copy. RFCU provided key points the letters should cover, JBCG drafted the letters, then RFCU refined the copy to more closely reflect the signee’s writing style. The annual report went from 60+ pages to four and reduced the printing expense by 60%!